This has been several months in the draft stage due to me not having a computer to finish it on until recently. It’s nice to have something to type on that doesn’t require glasses in order to see. But anyways, for my 46th birthday I wanted to visit my family in California. I’ve been away too damn long and really needed a dose of vitamin ‘C'(alifornia). My wonderful husband made the arrangements and opted to stay home so I could have some much needed family time with my nephew and his wife and 4 littles . In preparing for my visit I decided to browse around the internet for ideas of things that my nephew and I could do together. 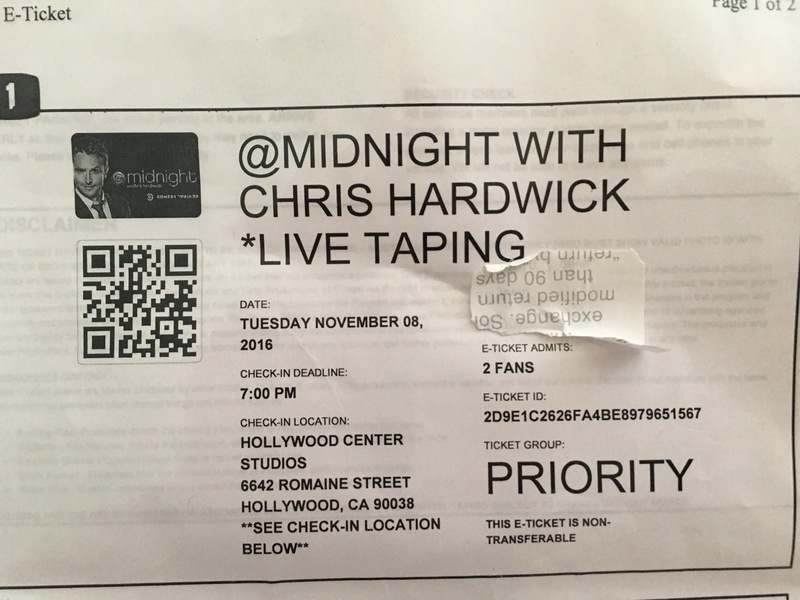 We both are huge Chris Hardwick fans, so I did some research and found out that 1iota (www.1iota.com) offers audience tickets for many live tapings of shows such as @midnight…. by signing up for their website and submitting a request form giving a brief explanation on why you feel you should be selected as a part of their studio audience (I am assuming that originality in this portion of the request form may better your chances in it standing out from the other requests. I totally played the birthday card on mine!). I was given the option of requesting 1 or 2 tickets. If you want to bring a guest, the site requires that you enter the name and email address of the person that is going with you. After I submitted my request form I received a confirmation email acknowledging receipt of my request. After that, it’s a waiting game…..you can check the status of your requested tickets in your 1iota account. Mine were showing as ‘waitlist’. 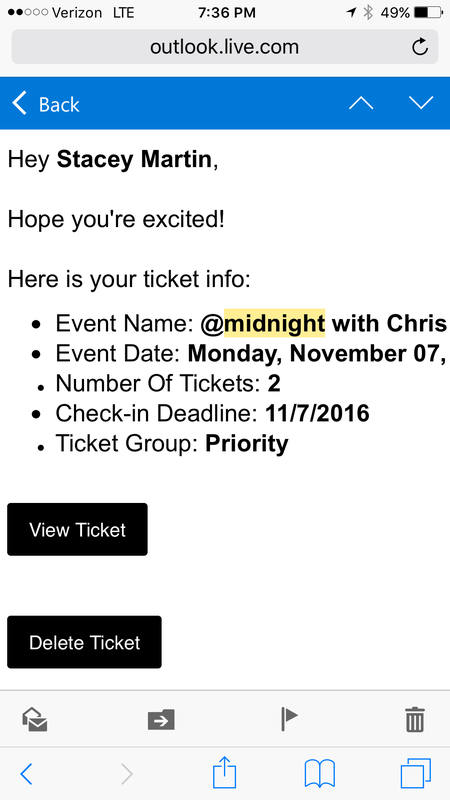 A week or so later I receive an email informing me that my tickets request status had been moved from waitlist to ‘priority’! Priority! That sounded important! Yay! On the website you can once again confirm that you do want to go to the show and in the email there is a link where you can print out your ticket. I printed mine out and kept it safely in a plastic page protector. Wait…. does that ticket say ‘LIVE’? Yep it does! Because the show was on election night they decided to do a special taping. 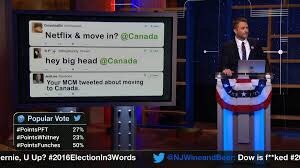 Since @midnight covers topics happening in the world and current news, it only made sense that they would make election night (aka The Demo-pacalypse) the granddaddy of all shows extra special! 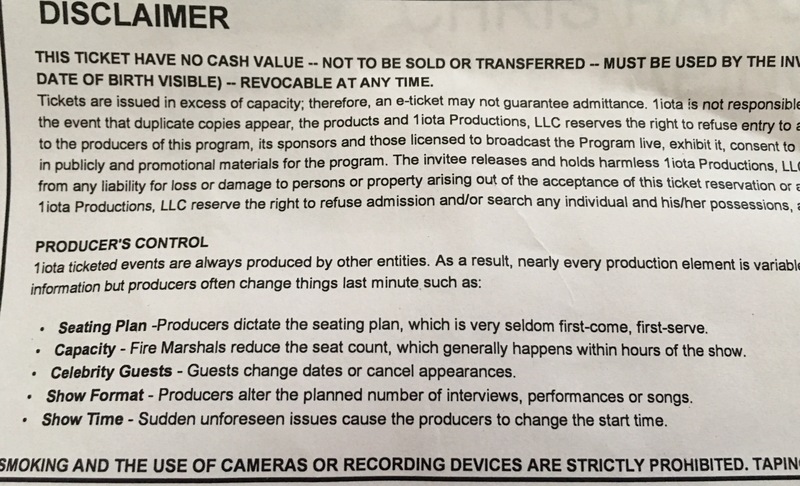 Of course, with any studio audience admission, there are rules that needed to be followed. Upscale casual meant finding something cute to wear. Since losing 60+ lbs clothes shopping has become fun again rather than a painful, embarrassing chore. 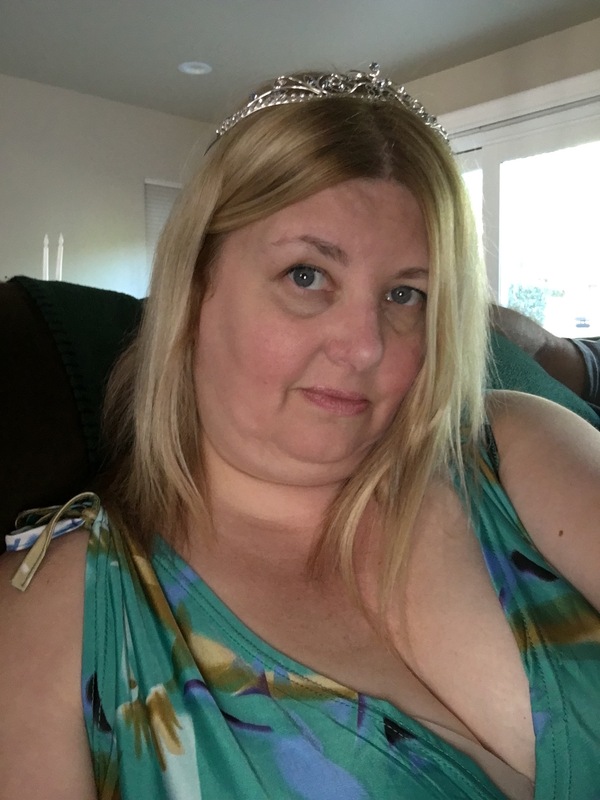 I had already decided for my birthday that I was going to wear a tiara all day! 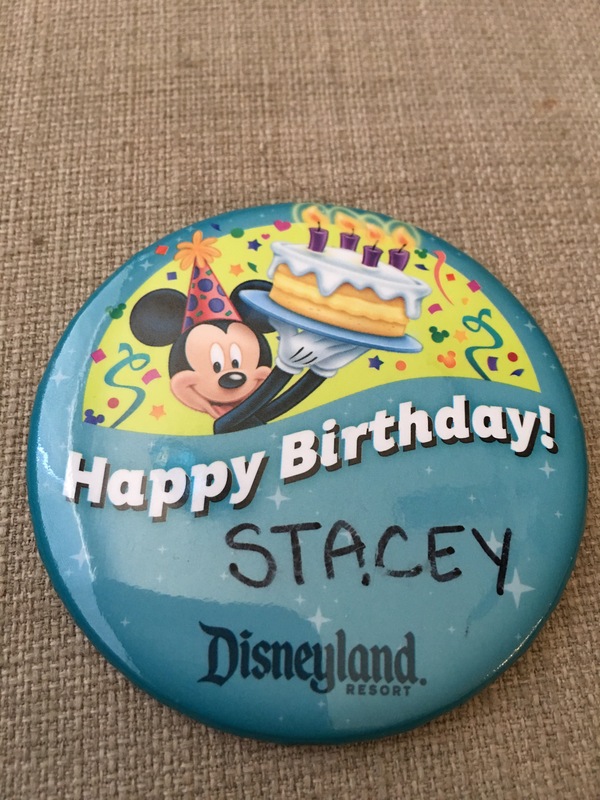 So i found a cocktail dress that matched my birthday princess tiara and at the last minute decided to also put on something i had acquired from Disneyland the day before….. why not, right?! 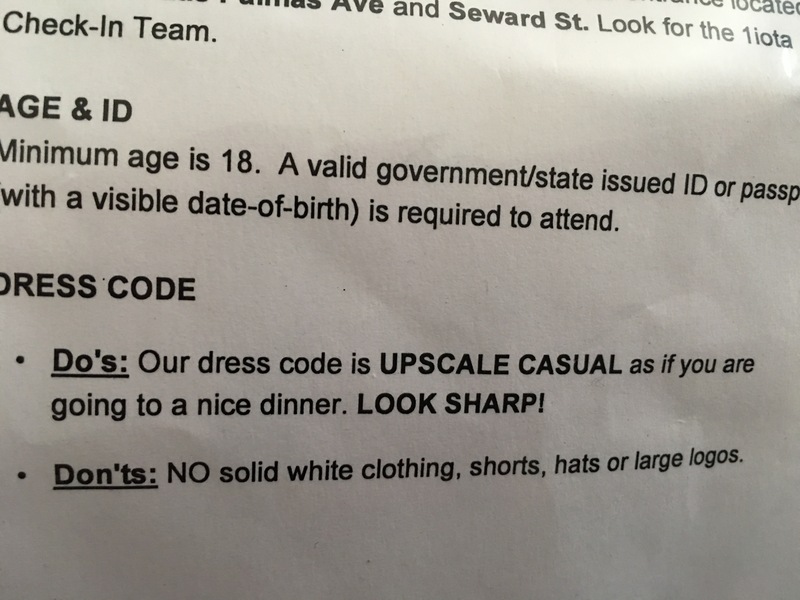 The other instructions on the e ticket are pretty self explanatory. No cameras, cellphones, food, drink allowed in the studio. 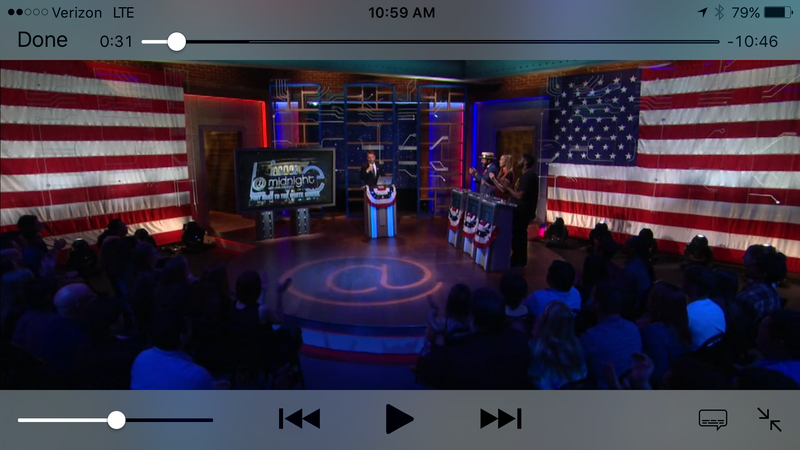 Understandable but I was bummed that I couldn’t at least get one photo sitting in the studio audience or…. even a selfie with Chris himself. My nephew and i obeyed the rules though, (begrudgingly!) and left our phones in the car. Brian and I had originally planned to arrive a few hours early since we had no idea what to expect, and heading to Hollywood on the night of the election was a guaranteed shitshow, however our GPS directed us right to the studio down a series of residential streets. The next thing we knew we saw a couple members of the 1iota team waving us in. We got there just in time to get a parking space right in front! Check in was a breeze and the staff at 1iota couldn’t have been nicer. 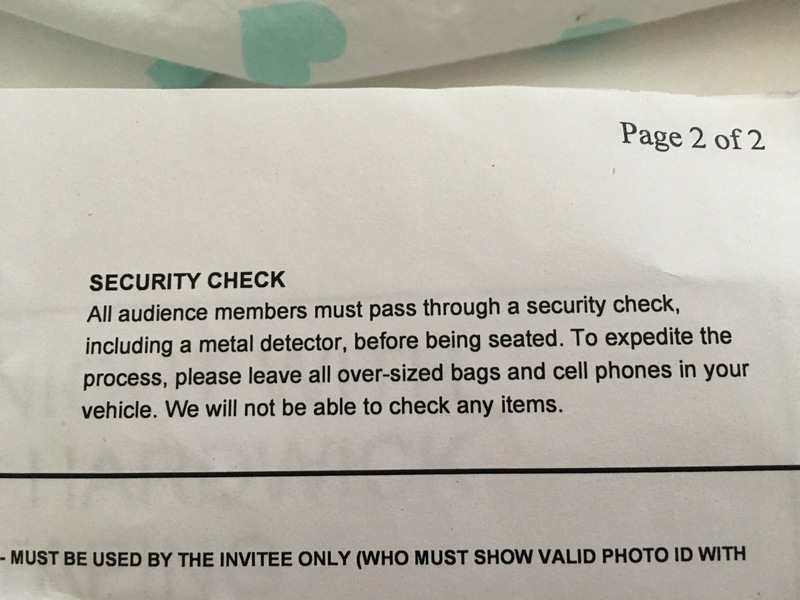 They checked our tickets, ids, and asked if we had any cameras/cellphones. (Again we were reminded to leave them in the car since photos and video were prohibited inside. 😢 *sniffle* no selfies with Chris and the guests…oh well, maybe some other time). After we checked in we were directed to sit and wait on some benches located outside of the studio door. We had gotten there early enough where we were at the end of the first of three long benches (think sports bleachers minus the height) We met and spoke to a few people who had been guests of the audience before. One lady said she had just found out that afternoon that tickets were available so she cleared her schedule so she could attend (if I lived close by you’d better believe I would do the same thing!) The 1iota crew were all so nice taking the time to stop and chat with several of the audience hopefuls as we waited to get an update on when we would be lead into the studio. We were seated in the second row right in front of the stage!!! One of the lovely iota employees made a comment to ‘let the Birthday princess sit right near the front’ which made my night all that more special. Yay! The stage was done up with the election night theme (Murica! ), and while everyone was being seated the Daily Show with Trevor Noah was showing on the tv on the stage. Trevor was sitting at his desk with a bottle of pepto bismol next to him and recapping live election updates. Since none of us had access to the inter webs and social media, we didn’t have any idea which way the presidential election was going. The update was met with a mixed gasp and groan from the @ midnight audience. Pretty soon the warm up comedian came out and started discussing what we were to expect when we went ‘live’. 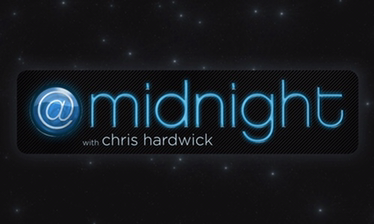 This was a new venture for @midnight, so tensions were extremely high. He told us that usually the show was filmed in a series of retakes over the span of a couple of hours at most, but on this night everything would be done with mistakes and all in 30 minutes. Thirty minutes! We were also told to not get up from our seats once the show started. 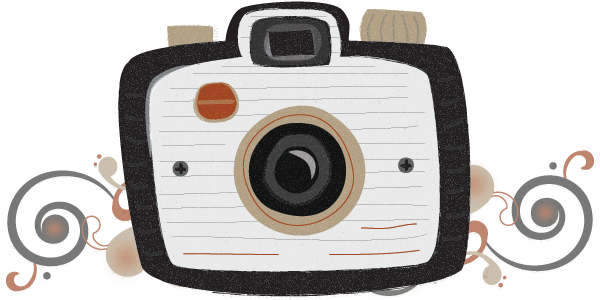 Some of the cameras passed right over your head and I would imagine could easily clock you senseless if one were to stand up quickly. Also, we were told to laugh more than clap. 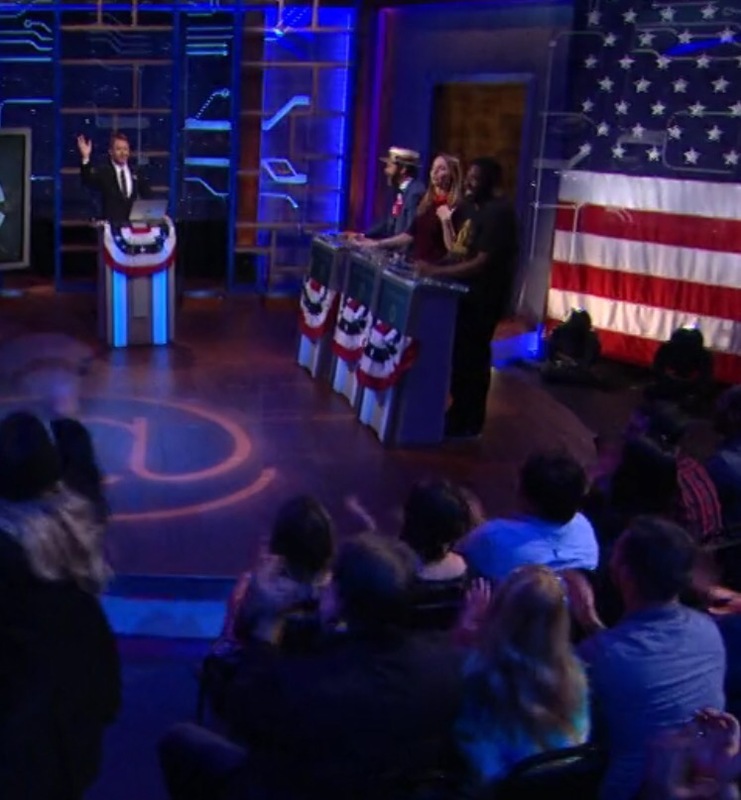 Applause would drown out the comedians as they played the game and cause the show to lag. The warm up comedian was great! Interacting with the audience and getting everyone involved and pumped for the show. He asked me why I was wearing my tiara in which I simply answered “it’s my birthday!” And when he asked me who gave me the tiara I said “I did!” Doh! Seemed a bit egotistical now that I look back on it. One by one the guest comedians were introduced and walked out on the stage. RON FUNCHES!!! Need I say more? The whole show went without a hitch, and for the most part us the audience remained well behaved during the live taping. There was a guy behind us that exclaimed loudly when there was a mention by the comedians that weed was now legal in the state of California. He let out a ‘WOOOOOOOOOO!” which people snickered at, but at one of the commercial breaks my nephew overheard one of the producers telling the guy to not do that again. (Of course I’m sure he felt it was worth it since it warranted a response from Funches.) Also in between breaks the makeup staff would rush out and freshen up host and guests, and Chris would check his laptop, phone and listen into his earpiece all at once. He did come out once on break and personally thank the audience for being so great on what was a very tense night for everyone involved with the show. 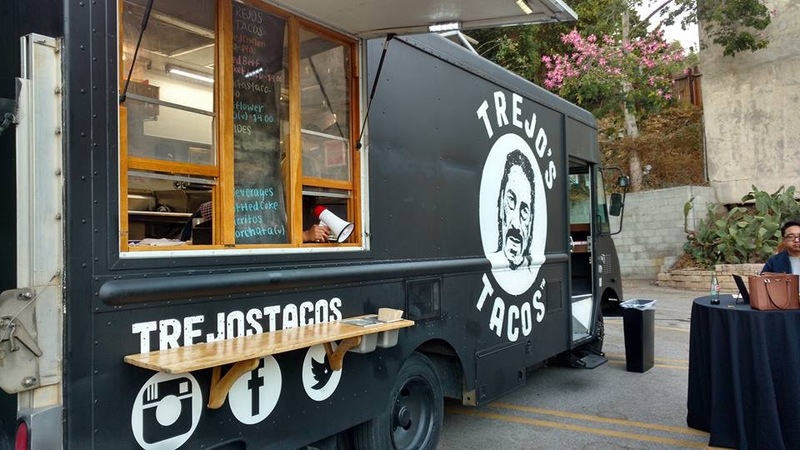 Oh and there was a surprise appearance from Doug Benson… because… marijuana and tacos. At the end of the show everyone filed our, we got into our car and headed home. Overall we had a fantastic time and I had one of the best birthdays ever! The show went really fast but I’m so happy that we were able to attend the first live taping which happened to be ON my bday and had an amazing panel of guests. It really made me miss living in California. Maybe someday. Maybe after Japan…. One more thing, at the very end of the show Chris went down into the audience and across each row ‘high fiving’ each of us. When he got to the person sitting to the other side of my nephew, he somehow stumbled and landed a brief moment between Brian and me. I may not have gotten a selfie with Chris, but I did get to play a part in helping him not fall onto the floor. lol. 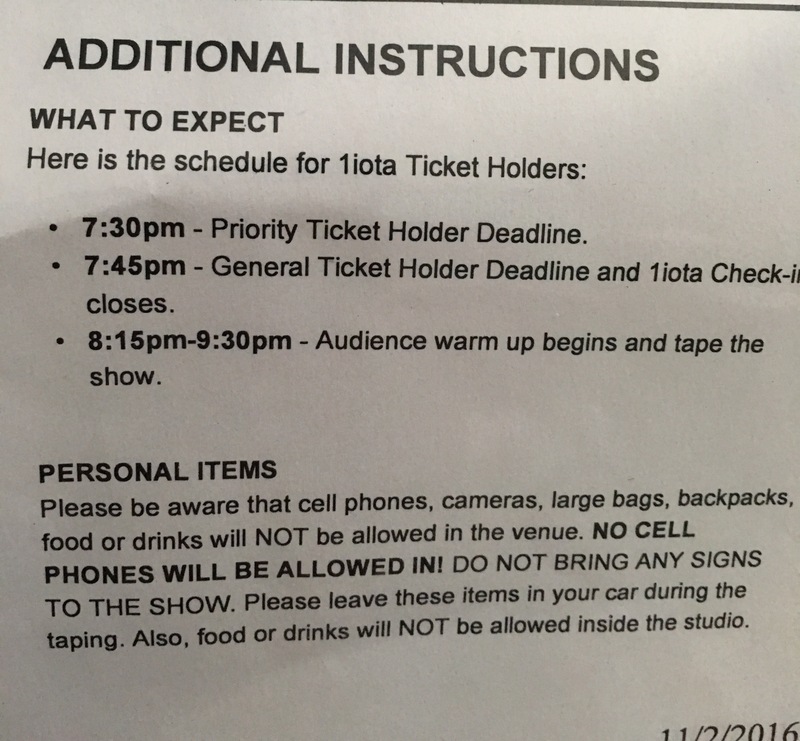 If you are ever in the LA area and want to see a live taping of a show, whether it be @midnight or something else, check out http://www.1iota.com and see what they have to offer. They are SUPER nice, and have some great opportunities to be a part of some really great events and live tapings (coughTalkingDeadcough). Actually they aren’t just in California… just go check it out for yourself and I’d love to hear anyone else’s experiences. Let me know!